Once in a while, I get asked to make a piece for a benefit raffle or auction. A few months ago, I was contacted about doing a piece to benefit Ernie Gygax, the eldest child of Gary Gygax. Ernie has had some medical issues, and the bills have been piling up. 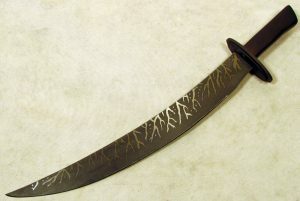 Ernie and I conspired, and we decided on a short sword, with the design left mostly up to me. 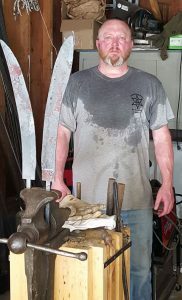 There are fewer pictures as when I did the Cthulhu cutlass to avoid redundancy. As always, we start with forging. Shadow Bane was forged concurrently with a sister sword that I will finish sometime in the near future. Some of the pictures will show both swords. 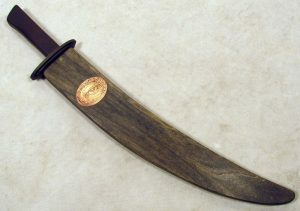 The scabbard features two etchings. The one in the top picture is done in steel. Its color and design may cause some old school gamers to feel nostalgic. The one in the bottom picture is done in copper. The etching mask was made from original art created by my brother, David Gdula. If you look closely, you may recognize the eye. 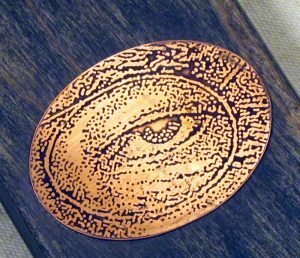 If you’re very fortunate, you may have looked into that eye from across the gaming table. 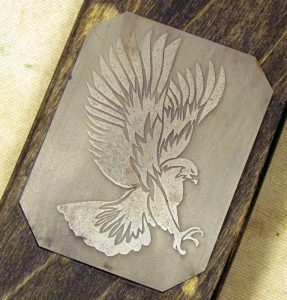 These etchings use a different masking process than the etchings that are done on the blades. For these, I (laser) print the art onto a transfer paper normally used for printing circuit boards. The toner, which is PVC plastic, is then transferred to the metal by passing it through a hot roller. (I use a commercial grade laminating machine.) This process allows for much finer detail as well as very accurate reproduction in unlimited quantities. Here, the guard and handle have been mounted. Both are done in the Indonesian style but somewhat toned down. 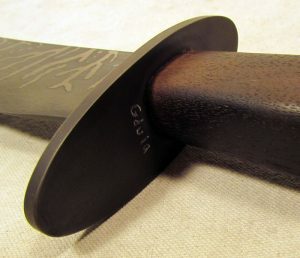 The guard is 3/16″ steel. 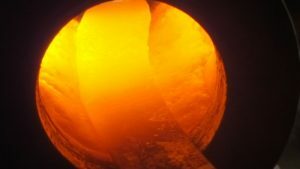 It is elliptical, cold blued, and is flux core welded to the tang. There is a leather overlay on top of the guard. 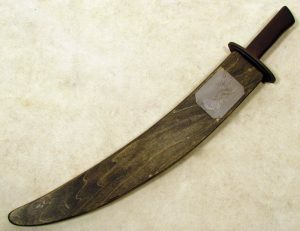 The tang is of the “hidden” type, is integral and was hardened with the blade. There are notches cut in the tang and there are two hidden pins. These help lock the tang into the handle, which was drilled and filled with shock resistant epoxy. The handle itself is torch blackened black walnut that has been stabilized in wood hardener under a vacuum. 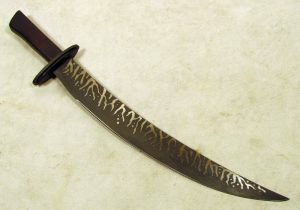 The sword’s total length is 21.75″, the blade is 16.5″, and the cutting edge is 14.5″. It is made from 5160 steel and is fully functional and ready for heavy cutting. I recommend tatami mat for cutting with live blades, but I don’t recommend doing this without training. It can be dangerous. Here’s the sword in its poplar scabbard (the scabbard was made the same way as the Cthulhu scabbard), with the etchings mounted. A Chance to own this Sword! I didn’t hesitate to make this sword for Ernie. The Gygax name has been spoken and in print in my home for decades. I never met Gary Gygax, yet he had a profound effect on my life. Now, it’s your turn, Kobolds. There will be a roll off soon after the fundraising ends on 9/22/16. You can get one roll for each $10 donation. 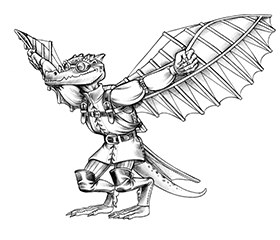 The trust for this fundraiser is being managed by Luke Gygax, and the trust email address is ernestgarygygaxjr@gmail.com. Donations can be sent to the PayPal account associated with that email address. Please donate, and please share the threads. Don’t hesitate to send me a friend request on Facebook. If we have no friends in common, please PM me so I know who you are. 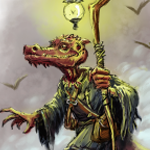 Let’s get to it, Kobolds! Another fine piece of work. Good luck with the fund raising. Thank you thorr-kan. So far, so good.